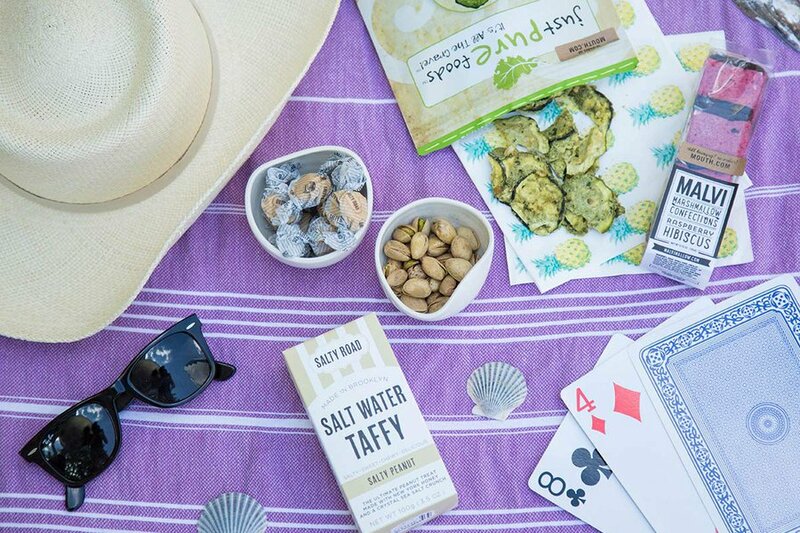 Our favorite snacks for your next summer adventure. Photo by Evie Cheung. It's the final stretch of summer, which means we're squeezing in as many beach days, poolside hangs, and backyard picnics as our schedule allows. Each occasion calls for ... snacks, of course ... and not the kind found at your local convenience store. We're partial to the small-batch, handmade, delicious, and beautifully packaged variety sold by Mouth, the DUMBO-based online purveyor of US-made artisan foods. 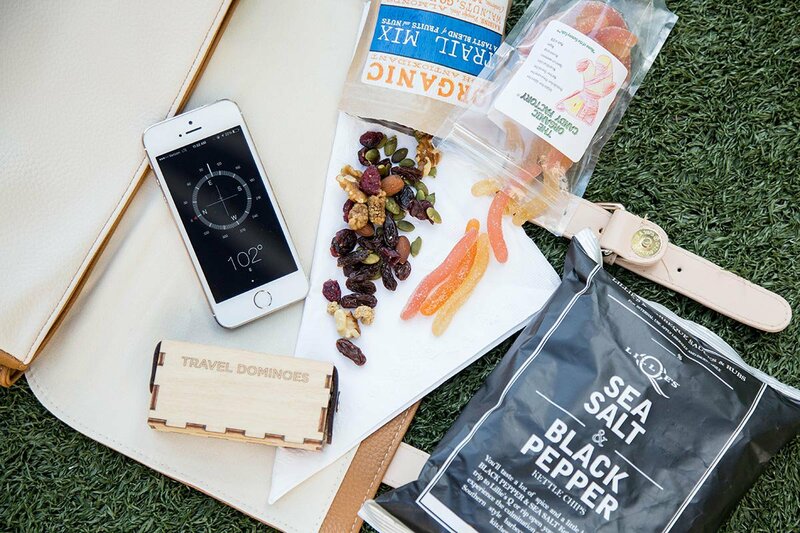 We partnered with Mouth to bring you a selection of our favorite travel-friendly eats — organic gummy worms, beef jerky that will turn any naysayer into a convert, and quarter-sized oatmeal cookies sure to liven up the longest of international flights. Each snack was personally tasted and approved by our Fathom team. We hope you enjoy! Break from the heat with a festive spread. Pair perfectly crunchy tortilla chips with a light-and-smoky salsa. Follow with whisky-infused chocolate ganache cookie sandwiches. Zukali Aji Pepper Salsa, $9. Tortilleria la Nina Tortilla Chips, $8.25. Whimsy & Spice Hazelnut Whisky Sandwich Cookies, $11. Traveler by Toms Sunglasses, $78. Canvas Home Dauville Chip and Dip Plate, $98. 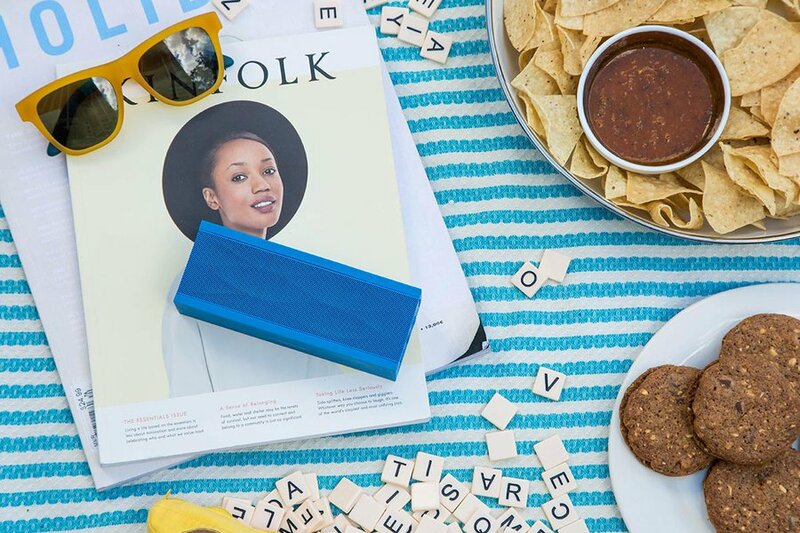 Jawbone Mini Jambox, $129. Keep energy high with a sustainably sourced sweet-and-savory trail mix and a bag of crunchy, peppery kettle chips. Don't forget the creepy crawlers! They're naturally-flavored and actually taste good. Allgood Provisions Organic Trail Mix, $6. The Organic Candy Factory Gummy Worms, $9.50. Lillie’s Q Salt & Pepper Kettle Chips, $3.50. Rockland Backpack, $89. 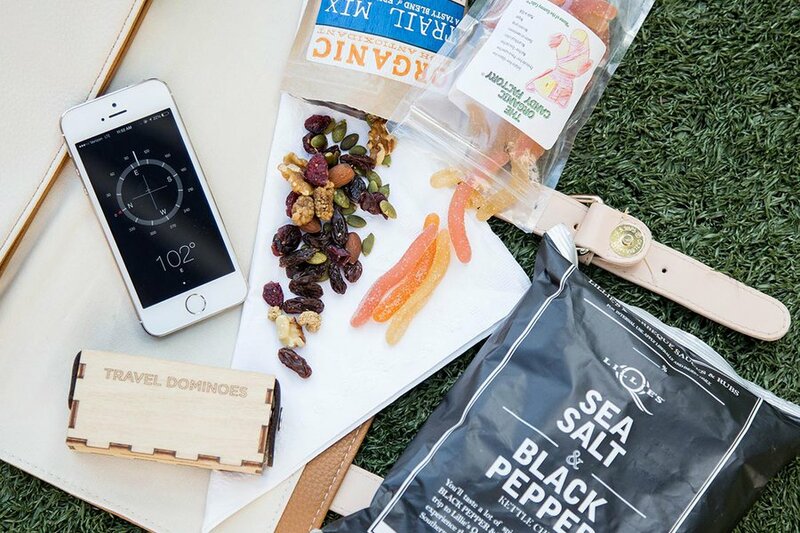 Walnut Studio Travel Dominos, $75. 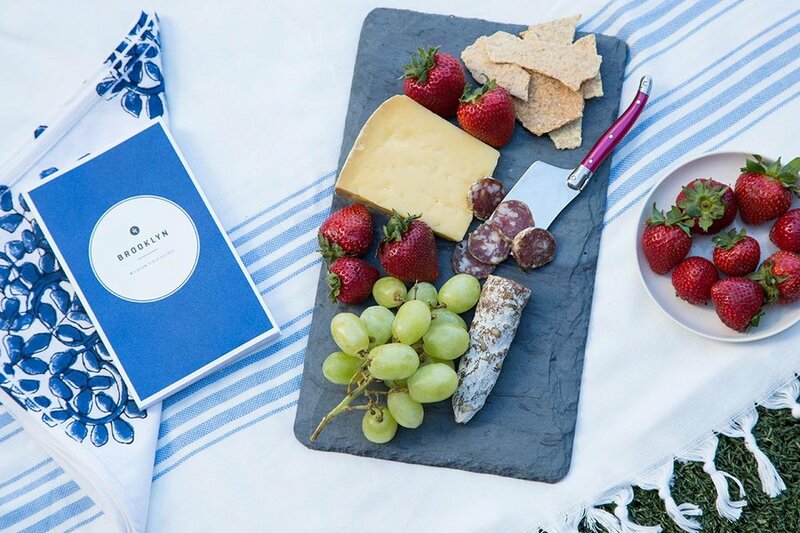 Load up your basket with beautiful linens, hand-glazed porcelain, fresh fruit, and a picnic-perfect charcuterie spread. Olympia Provisions Saucisson Sec French Salami, $12. Robinson Farm Tekenink Tomme Cheese, $12. Z Crackers Sea Salt and Olive Oil Crackers, $6.50. Cuyana Turkish Towel, $55. Madeline Weinrib Blue and White Moroc Blockprint Napkins, $120. Brooklyn Slate Co. Cheese Board, $42.50. Canvas Home Tidbit Plate, $8. As day turns into night, it's nice to have a supply of retro treats, like salt water taffy and fancy moon pies. Pack an oversized hat to ward off the fading sun. Gilded Nut Snack Co. Sea Salt and Pepper Pistachios, $7. Salty Road Salt Water Taffy, $7.50. Just Pure Foods Pesto Zucchini Chips, $10.50. Malvi Raspberry and Hibiscus Marshmallow Cookies, $8. Cuyana Summer Hat, $75. Jumbo Playing Cards, $4.29. 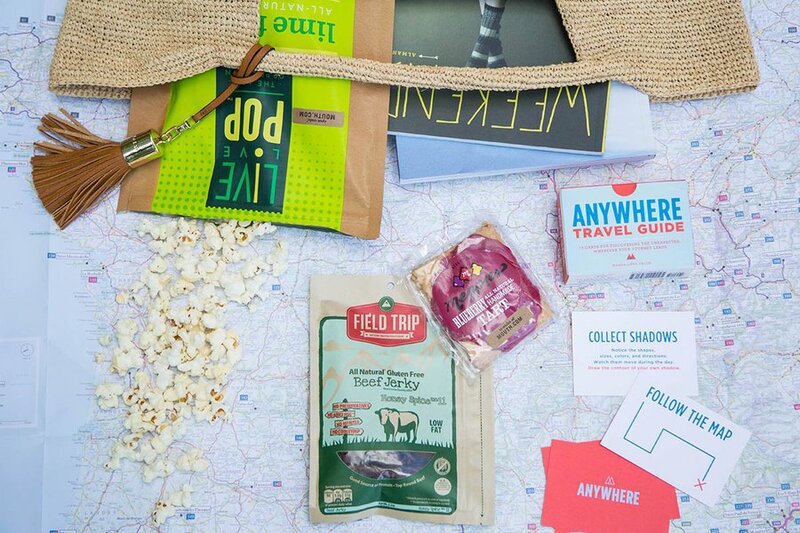 Stash a stylish beach tote with the essentials: a travel guide that works in any country, zesty lime-flavored popcorn, the best beef jerky in the world (really), and a gourmet take on a portable childhood classic. Live Love Pop Zesty Lime Popcorn, $8. Field Trip Beef Jerky, $9. Megpies Bakeshop Blueberry Popped Tart, $4.25. Heidi Klein Bucket Bag, £220. Anywhere Travel Guide, $12. 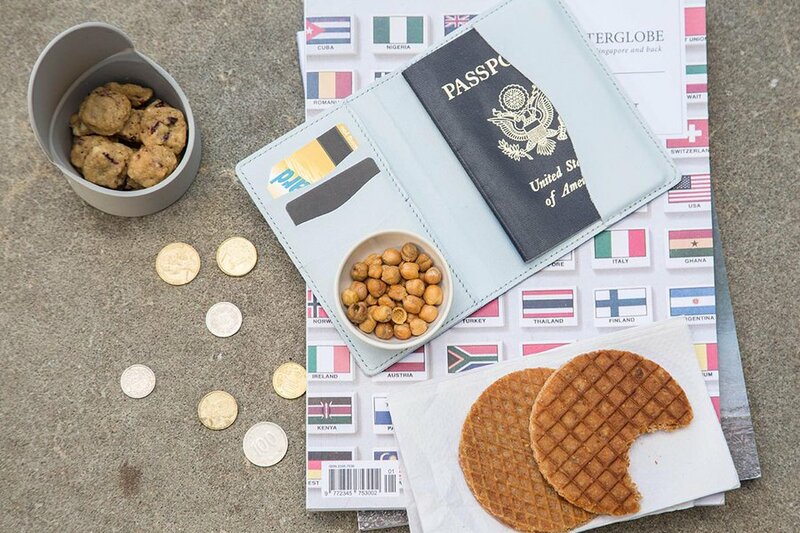 Skip the tired airport snack aisle in favor of your own gourmet eats: roasted chickpeas, bite-sized cookies, and a Dutch-inspired sweet treat. Pulse Roasted Chickpeas, $4. Stroopies Stroopwafels, $12. Carla Hall Petite Cookies, $9. Phold Silicone Storage Container, $16. Cuyana Slim Passport Case, $85. Canvas Shell Bisque Small Bowl, $8.50.